My update is a couple days late this week. For some reason I’ve found it hard to write another update. I think I am getting to that point where it’s all blurring together, and although I’ll be considered “full-term” in 6 weeks which seems quick, I also feel like I’ve been pregnant forever. The second of the 2015 YWAM Newie babies was born this weekend – on Mother’s Day in fact! Daniel and Dieuwke welcomed little baby Zara into the world Sunday morning, and she is absolutely beautiful! A perfect looking little baby. I can’t wait to snuggle her. I am sure holding her will only heighten that revelation that I am going to have to push something of a similar size out of me pretty soon. I always thought newborns were so, so tiny – until I became pregnant. Back in February when little Esther was born, I remember holding her and even though she was little, she seemed massive to me considering I had a little baby growing inside me. I can only imagine that revelation will be even stronger this time holding baby Zara. Food Aversions: Food in general didn’t sound appealing a few times this past week with the slight nausea but nothing too specific. Symptoms: Back pain! In the last couple weeks, I have definitely noticed the back pain ramping up A LOT! I can’t really sit for more than 20-30 minutes without major pain/numbness in my lower back, and occasionally, it will continue to my feet where they go numb as well. I went to the Midwife yesterday for my appointment and mentioned this to her. She recommended that I see the physio so they can see if there’s anything that may be helpful. I have an appt. for that on Thursday. She also recommended swimming, so I may call a local gym and see if there’s a way to utilise their pool without doing a full commitment to the gym. Baths seem to help and laying on my side is also helpful. Other than that, I am just feeling big and tired most of the time. I don’t have tons of energy, partly because my sleep is pretty worthless these days. I wake up every couple hours to go to the bathroom, and generally one of those times I can’t fall back to sleep. 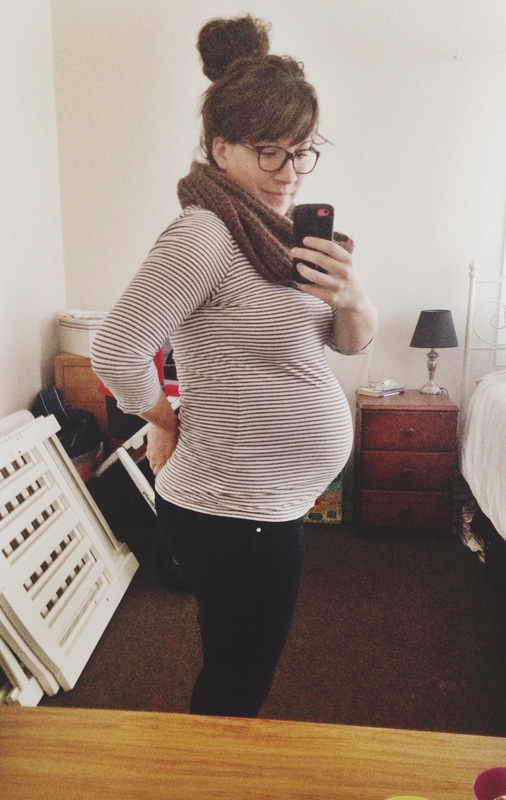 New this week: I had another midwife appointment yesterday. This was the first time she actually felt around to see how the baby was positioned. She said they normally don’t do that until after 30 weeks. The baby’s head was down, and they were facing my left side with their bum and feet up near my ribs…which makes SO much sense considering the pushing and kicking in my ribs I’ve noticed in the last few weeks! I was measuring just right – 30 centimetres for my fundal height, which is roughly in line with the number of weeks you are pregnant. Blood pressure was great. Heartbeat was great. The midwife I’ve been seeing for my appointments is great. She’s very helpful and super sweet. I go back in 3 weeks this time, followed by every 2 weeks and then every week once I hit 38 weeks. Some of those realities just reinforce how quickly time is flying! I was chatting with a friend this morning and just commenting that I cannot remember another year that has gone as fast as this one. How is it nearly the middle of May already? When we first found out I was pregnant, there were all these markers that I was looking ahead to – the 2nd trimester and announcing to everyone, the 20-week ultrasound, Robbie’s birthday, Robbie starting the school, the trip to the States, my baby shower, birth and parenting classes, etc. Pretty much all of those are past now… I guess we can really say we’re in the home stretch! Robbie began painting the cot yesterday. Because of the paint that’s more durable and less likely to come off if the baby were to chew on it or anything, I couldn’t help with the painting. I was really looking forward to doing that together, but nevertheless, I am so thankful for his willingness to do it for us! Once that’s all done, we just have a few more things to pickup and get our bags packed in a few weeks and we’ll be all set! Looking forward to: Seeing what the physio says and what can hopefully help with my back. A breastfeeding class in a couple weeks. Meeting Little Bean – pretty much obvious but the closer we get, the more excited I get!!! Miss anything? Sleeping well – not getting up every hour or two, sleeping on my stomach or on my back. My body being my body. Sushi. Energy. Exercise: I’ll get back to you on this one after chatting with the physio. I haven’t been very motivated given the back pain, although I try to still walk around when possible.